The NLST shows lung cancer screening mortality benefits among heavy smokers, but how that translates to screening recommendations remains to be seen. With cancers such as breast, colon, and prostate, early detection is known to reduce mortality. But until the preliminary results of the National Lung Screening Trial (NLST) were released in early November 2010, that hadn’t been the case with lung cancer, which claims 160,000 lives each year in the United States. Previous studies done in the 1970s showed that while chest x-rays helped detect cancers at an earlier stage, they had no effect on overall death rates. A more recent multicenter study led by researchers at Memorial Sloan-Kettering Cancer Center in New York showed no benefit of CT screening for lung cancer either, although it was not a randomized trial set up to detect a significant mortality difference. The National Cancer Institute’s (NCI) NLST is the first randomized trial to produce clear evidence that screening with CT reduces lung cancer mortality by 20%. “The initial results recently released are a piece of the puzzle as to whether we can reduce lung cancer deaths with screening, and 20% is really significant,” says Ella A. Kazerooni, MD, chair of the ACR Chest Imaging Committee and principal investigator of the University of Michigan site for the NLST. The NLST looked at more than 53,000 current and former heavy smokers between the ages of 55 and 74. At the start of the trial in September 2002, the patients from 30 sites across the country were screened with either a standard chest x-ray or a low-dose helical CT scan. Each group was then screened twice more over the next two years with the same modality. The participants were followed for up to five years and their deaths counted: There were 442 cancer deaths among those who received conventional x-rays and 354 lung cancer deaths among those who received CT scans. 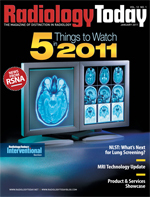 The NCI’s decision to announce the initial findings from the NLST was made after the trial’s independent data and safety monitoring board notified the NCI director that the accumulated data provided a statistically convincing answer to the study’s primary question—whether screening for lung cancer with CT, when compared with chest radiographs, reduces lung cancer-specific mortality—and that the trial should therefore be released. While everyone agrees the randomized study was well done, it has caused a huge debate over whether screening for lung cancer should be recommended as mammography is for breast cancer or colonoscopy is for colon cancer and, if so, for whom: All smokers? Heavy smokers? Older smokers? Nonsmokers? Among the questions that will need to be answered regarding lung cancer screening are the following: Who should be screened? At what ages and what intervals? Screening CTs are more costly than conventional x-rays or mammograms, so is it cost-effective to screen a large population with CT? Who pays if screening is recommended? What about the effects of radiation from CT screening? Low-dose CT scans expose patients to considerably more radiation than standard chest x-rays, so do we know enough about the cumulative risks of such scans and whether they would balance out the benefits of the information they provide? Also, more scans mean more false positives, and once a suspicious lesion is discovered, can it be ignored? This NLST looked only at current and former heavy smokers, those who had used cigarettes for at least 30 “pack years.” That is, they smoked an average of at least one pack per day for 30 years, which also means they could have smoked two packs per day for 15 years or three packs per day for 10 years. All the participants were between the ages of 55 and 74 when they were enrolled in the study. “That is a relatively well-defined group of patients,” Hartman says. But what about someone who is aged 50 and smoked for 25 pack years, Hartman asks, or someone aged 45 who smokes three packs per day? “Would they have the same benefit of CT screening? We don’t know. Is there anything this study and other prior studies can say about them? Obviously there will be some additional discussion,” he says. As more data are released, says Kazerooni, the panels making screening recommendations will have to look closely at whether there were groups where the mortality was reduced more than others. “Are there some subgroups where screening didn’t have as great an effect?” she asks. A bigger issue may be whether CT detects too many cancers, Kazerooni says. Some people will have small cancers that stay dormant, and they could die from something else and never know that they were there. But once you detect even a small cancer in a CT screening, it’s likely to lead to biopsies and perhaps surgical procedures to remove potential or possible cancers. The cost can escalate, perhaps unnecessarily in some cases. “It’s very unusual to let something of uncertain origin lie dormant,” Bach says. Instead, U.S. physicians are inclined to treat more aggressively and observe what happens. Of all the screens in the study, spiral CT detected 24.2% positive scans compared with only 6.9% positive scans for x-ray. However, only 3.6% of the CT positives actually were cancer, while for the x-ray group, 5.5% turned out to be cancer. Several groups, including the American Cancer Society, the National Comprehensive Cancer Network (NCCN), and the USPSTF, have already indicated they are open to looking into the results of the NLST once they are published and will weigh in on whether to recommend screening for lung cancer, particularly among high-risk populations such as heavy smokers. If any of the groups come out in favor of screening CT, it will hold considerable weight with the Centers for Medicare & Medicaid Services, and the organization’s position will affect reimbursement. “It won’t make the decision for them, but it will potentially influence their thought processes,” Kazerooni says. But with at least 90 million current and former smokers in the United States, a widespread screening program of people at risk could be quite costly, and the ultimate cost will undoubtedly play into the decision making. However, Kazerooni is optimistic. The evidence from the NLST that older, heavy smokers could benefit from CT screening for lung cancer is pretty overwhelming, she says. “It’s pretty hard to refute this data from a very well-designed study. Lung cancer mortality was reduced by 20% when you screen with CT. That’s pretty irrefutable evidence,” she says, noting that the NLST expects to submit the paper on primary end points for publication in the first quarter of 2011 and the cost-effectiveness analysis later in the year. Patz says screening recommendations will ideally be combined with biomarkers to better identify those who are at high risk of lung cancer. As part of the NLST, he says, biospecimens (serial blood, sputum, and urine samples) were collected with the goal of validating their ability to help detect early cancers. “Biomarkers have the potential to improve diagnostic efficiency, reduce cost, and affect the evaluation and management of these patients,” he says. While the NLST is good news for smokers, “it’s not the final answer on what we’re going to do and how we’re going to do it with regard to lung cancer screening,” Hartman says. Also, he says, physicians must continue to emphasize—as they have all along—that not smoking in the first place is far better than trying to detect lung cancer early and preventing death from the disease. According to the Centers for Disease Control and Prevention, men who smoke increase their risk of death from lung cancer by more than 22 times; women who smoke increase their risk of death from lung cancer by nearly 12 times. — Beth W. Orenstein is a freelance writer based in Northampton, Pa. She is a frequent contributor to Radiology Today. Plain X-Ray Screening: Is It an Option? Preliminary results from the National Lung Screening Trial (NLST) show that screening high-risk patients with CT reduces death from lung cancer by 20%. Steve Worrell, chief technology officer for Dayton, Ohio-based Riverain Medical, sees how the results could mean a bigger role for digital chest x-rays as well. Worrell explains that while low-dose CT scans are used in the study, the issues of radiation exposure, cost, and availability are still raised. Even low-dose CT delivers 15 times the radiation dose compared with a conventional chest x-ray, he says. “This increased radiation exposure is dangerous and can actually increase the risk of lung cancer,” Worrell says. The cost of a CT scan is about six times that of a chest x-ray, assuming a CT scan is only $300 and a chest x-ray about $45. Many facilities charge significantly more for a CT scan, and insurance coverage for screening CT varies from policy to policy. Also, Worrell says, not everyone has easy access to a CT scanner. Only 60% of U.S. hospitals have access to a spiral CT scanner, the kind used in the NLST, while x-ray is ubiquitous technology. “It’s available in every hospital and in many doctor’s offices as well,” Worrell says. Another reason Worrell sees a bigger role in screening for chest x-ray is that since the NLST began in 2002, x-ray technology has advanced, making it capable of detecting smaller lesions earlier, making cancers more treatable. X-ray technology also may help detect lung cancer in patients who are not at high risk. While x-ray technology has advanced, there are still no clinical studies showing that x-ray screening for lung cancer provides any mortality benefit—that patients actually live longer because of x-ray screening. That absence of a mortality benefit was a primary argument against CT screening before the NLST showed a 20% reduction in lung cancer deaths with it. The NLST involved 53,000 current or former heavy smokers, with estimates indicating there are more than 90 million people in the United States who are current or former heavy smokers. The cost of sending them for annual CT screenings would be enormous, but if patients could be “triaged” with chest x-rays, screening CTs could be used for only those who truly need the test and then, Worrell says, the risks/benefit ratio might clearly support screening. Riverain offers two software technology applications—SoftView and OnGuard—that “are about improving the effectiveness of the chest x-ray,” according to Worrell. SoftView, which received 510(k) clearance from the FDA in March 2010 for the initial detection of lung nodules, uses existing x-ray equipment to provide a soft tissue image for digital chest x-rays. Using image processing and pattern recognition technologies, the system suppresses bone in the chest x-ray; the resulting image improves the visibility of tissue within the lung. “SoftView delivers no additional radiation dose to the patient and does not require any additional patient procedures or specialized equipment,” Worrell says. OnGuard, which received FDA approval this past June, is computer-aided detection (CAD) technology. It identifies solitary pulmonary nodules on an existing chest x-ray, helping reduce oversight and increase sensitivity. OnGuard uses pattern recognition and machine learning technology to detect nodules. Well-centered, scaled markers are then placed around regions of interest that may be early-stage lung cancer. Like SoftView, OnGuard has no additional dose requirements. With these two technologies, Worrell says, “we feel like it’s a really natural bridge to take us from where we are today to where we ultimately want to go with diagnostic CT.” Ideally, he adds, enhanced digital chest x-rays could be a first-line screening tool, and patients with suspicious or indeterminate lesions could then go on to CT screening.